It has been a long time since it was started, but the SHA/ASCL project to build an education and recreation centre in Namibia has at last reached a successful conclusion. Campaign Namibia began in 1997, when the then-president, Richard Fawcett, launched an appeal to revive the association's links with Namibia, initiated by the very successful project carried out in the 1990s under the leadership of Malcolm Hewitt. That first project raised an amazing £120,000, which was used to build no less than 12 primary schools in the very deprived region in the north of Namibia, at a time when the country had only just achieved its independence after a long struggle. The second project in 1997 raised an additional £43,550 and it was agreed to spend this on two projects, in partnership with World Challenge Expeditions and the Namibian High Commission in London. The first project with World Challenge Expeditions saw groups of sixth form students travel to Namibia to carry out small-scale projects in Namibian schools. Campaign Namibia paid for materials needed and these were often purchased locally in order to support the local economy. With the active support of the Namibian High Commissioner in London, a second, larger project was also agreed to build an education and recreation facility at Ondjora, a deprived rural community in the north of Namibia and £18,000 was allocated from the funds. The small projects were an immediate success. Over two years, 32 student expeditions redecorated classrooms, created football pitches and netball courts, irrigated a school garden and painted spectacular murals. Each group received £800. These activities enhanced the lives of Namibian students and provided life-changing experiences for the British students. The larger project presented greater problems. The difficulties involved in managing a project from six thousand miles away were considerable, but, after an initial visit to the site at Ondjora, plans were drawn up by local architects and contractors were identified to undertake the work. Progress was, however, desperately slow. An official of the Namibian Ministry of Basic Education and Culture agreed to act as clerk of the works and new contractors were found. Communication with people on site, in spite of emails and telephones, often took many weeks to achieve and the project looked at times as if it might take longer to complete than Wembley Stadium. Fortunately, World Challenge Expeditions came to our aid. Their representatives were able to visit Ondjora and helped not only to resolve the problems, but also to provide welcome reassurance that the building was well on the way to completion. 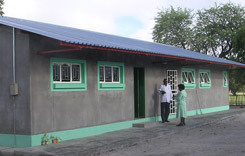 The building has now been completed and has been handed over to the local community in Ondjora. It is to serve as an educational facility for the local community, with a particular focus on information technology. A plaque has been installed in the building, commemorating the gift of the building by ASCL. It is hoped that World Challenge Expeditions will continue to send student groups to the area, with plans to enhance the facilities for young people in the centre. Thanks are due to the association members and the staff of World Challenge Expeditions and of the High Commission of the Republic of Namibia who served on the Campaign Namibia Steering Committee and especially to all those members and their schools who contributed generously to make the project possible.